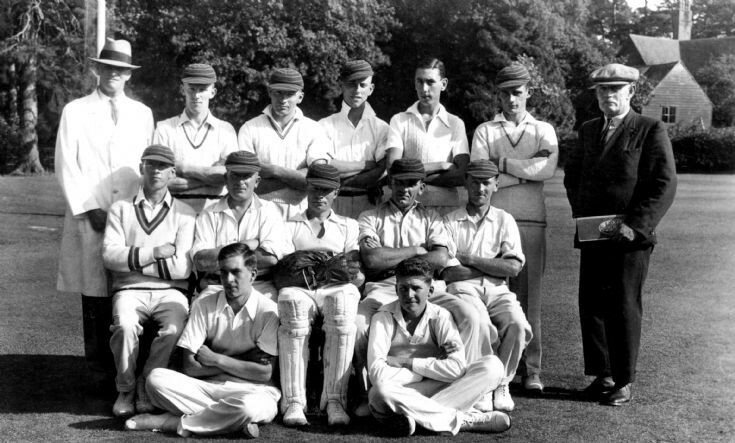 The photograph is of the cricket team from the Hyde estate in Handcross. In the background can be seen Truckers Hatch, formerly known as The Hollies. There are no details supplied with the picture, and the date has been estimated. From the left, back row: 1. A. Bartlett (Umpire), 2. Arthur Brown, 3. Unknown, 4. Unknown, 5. George Cooper, 6. Percy Bailey, 7. F. Vidler (Scorer). Middle row: 1. Tom Bailey, 2. Bill Doggett, 3. Percy Faulkner, 4. Walter Biggs, 5. William Biggs. Front: 1. Unknown, 2. Ken Doggett. Please can anyone add more names, or correct any of the above? My Uncle Billy Biggs is there. I loved that man he taught me to play cricket and I ended playing at a good level. I first played on strips he cut out at Handcross Park and eventually The Hyde.